Welcome to this week's edition of the Frugal Friday Linky Party! So glad you all could join me! Perhaps you've seen this pretty skeleton key art that Restoration Hardware sells for $199. Love it....but definitely don't love the price. I had similar frames that have been reincarnated a couple of times for my bedroom. If you've been reading my blog for any length of time, you may remember this version. Pretty, but definitely doesn't fit in my newly redone master bedroom. So I simply tore off the scrapbook paper that I used to wrap the mattes. Then I pulled out a few skeleton keys (luckily I have been saving them in my stuff-that-I-plan-on-using-to-decorate-someday collection) and hot glued them onto some scraps of linen fabric. Popped them into the frames and VOILA! My own skeleton-key art for free. And it looks very similar to theirs, don't ya think? Times that by 3, and I figure I saved myself about $600 AND I got the perfect art to fill up the empty wall space on the left side of the bed. Now I'd love to see what you all have been up to this week! 2. Please link back to the Shabby Nest so others can enjoy the frugal goodness that is the Frugal Friday Linky Party. LOL! That's too funny that you posted those keys! I did that project about a month ago! I went ahead and posted it to this party even though it isn't a recent project but I thought you'd get a kick out of it! Hope you don't mind! :) Love yours! So simple and easy.. Much better than the restoration version! I love the chunky-ness of your keys much much better and the linen is fabulous. They look great! What a savings too. Thanks for hosting. Hope you enjoy your weekend! They look exactly like the 'real' ones, great job. Thanks for hosting this wonderful link party each week! I love your key art. I love that the keys are a little chunky. They look great and are perfect on that wall. BTW I love your curtains. Love the keys! That looks so great! Thanks for hosting! is that even proper grammar? I love skeleton keys. Yours look so nice framed! Great idea. 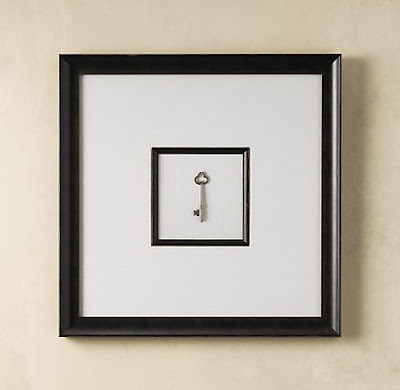 Love your version of the key art and it looks just right in that space in your bedroom! Beautiful. Love how your pictures turned out! I have an old key that I have been saving to frame, but haven't found the perfect frame yet- you've inspired me to keep looking! Thanks for hosting the party!! They keys look gorgeous! Thanks for hosting! Those framed keys look GREAT!!! I love the curtain fabric peeking out in the pics too! :) Have a wonderful Easter! Love, it thank you for the inspiration!!! AS ALWAYS! Your Frugal Friday link ups are the best! I love all the entries and ideas!